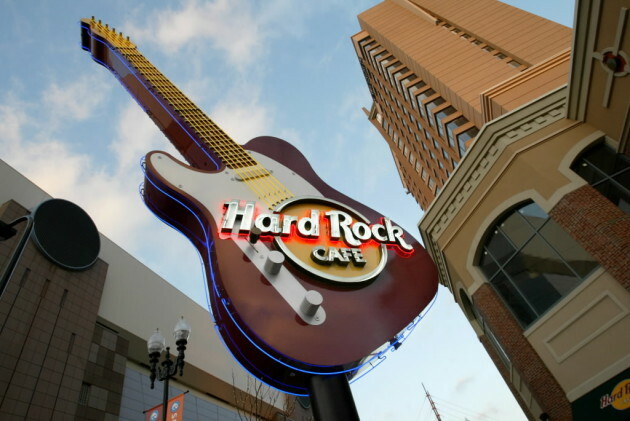 After a three-year hiatus, the Hard Rock Cafe is returning to Minnesota. This time, instead of Block E in downtown Minneapolis (pictured, above, in a 2002 Star Tribune file photo), where it had a home from 2002 to 2011, the rock n' roll memorabilia-soaked chain is opening a 400-seat outlet in the Mall of America in Bloomington. The Hard Rock, which operates 140 restaurants, 19 hotels and nine casinos in 56 countries, is promising two bars, a retail outlet and a music stage with capacity for 1,200 guests, located on the south side of Nickelodeon Universe, adjacent to the Peeps & Co. store on the mall's first level. Opening is planned for this summer. This isn't the mall's first brush with celebrity eatertaineries. Planet Hollywood had a 10-year Mall of America run that ended in 2003, and the Gatlin Bros. operated a music club from 1992 to 1996. Last month, 400 Bar owners announced plans for a new fourth-floor live-music venue, restaurant and music museum, opening in June. Hopefully this news also heralds the return of Prince's guitar and Christina Aguilera's bustier. Both were included in the memorabilia collection in the downtown Minneapolis Hard Rock.